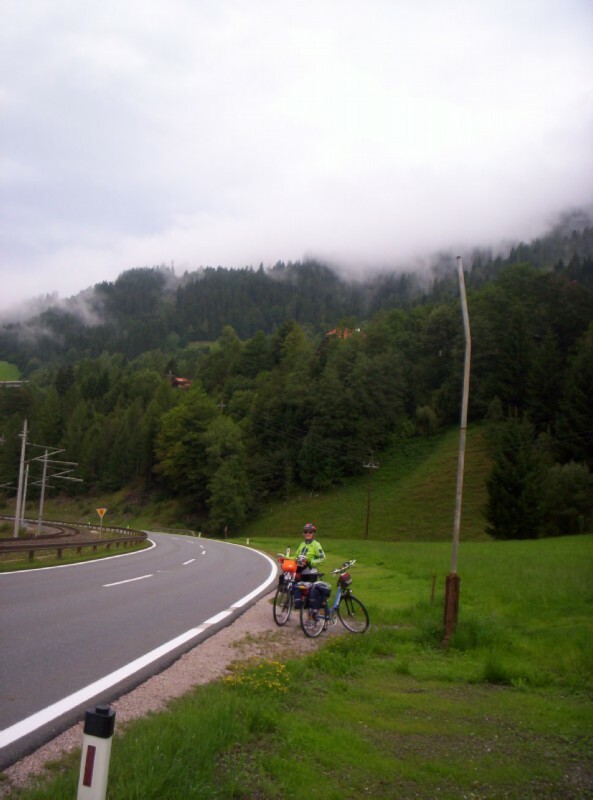 Aug 13 Saturday - intermittent light rain: When we arrived at the station for the trip to Radstadt, someone suggested that the 9:15 IC may have had bike cancellations because of rain. The agent said there was room, and we could take it using the same tickets. The IC had a city shuttle cab car on the front end with plenty of bike space. IC 515 calling at Radstadt. The city shuttle cab car with bike space is just barely seen on the front end. 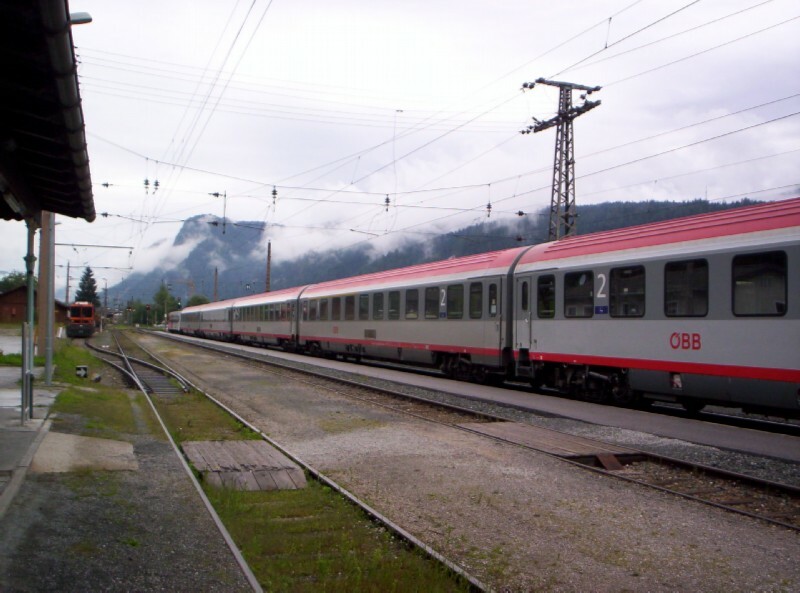 The route between Graz and Innsbruck is the only IC route in Austria that runs push-pull with a cab car, at least as far as I know. I find it much easier to load and unload bikes from the cab car than from the baggage car found on the other IC's. 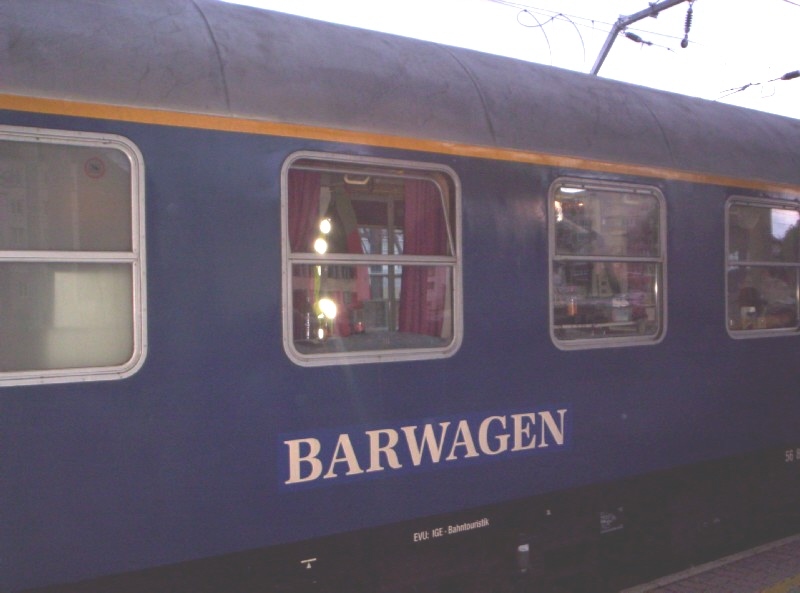 When we were last in the area in 2003 local trains stopped in Eben in Pongau and Altenmarkt in Pongau, both closer to Flachau than Radstadt. But locals had been cut back to AM & PM rush hours only. 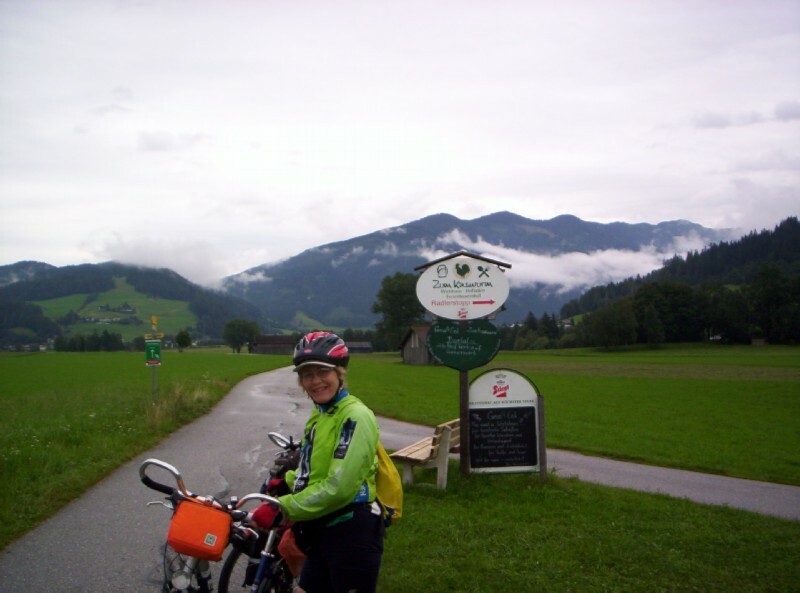 So we biked the 9 miles on the Ennsradweg via Altenmarkt to our accommodations in Flachau under intermittent light rain. I had remembered that to get to the Ennsradweg from the Radstadt station, you had to backtrack a couple of blocks and then cross the Enns. The sign between Radstadt and Altenmarkt pointing to a snack bar had changed and a bench added since 2003; but the mist, barn, Ennsradweg sign, and chalk board listing the specialties of the day were still in the same place. Click to compare with 2003. Kathi's apartments. It was a brand new building and our small apartment had a bath tub. At only 14E per person, we opted not to have kitchen privileges. But I did get a high speed internet connection using an ethernet cable. Although it was only two blocks from the flat center of town, it was on a plateau up a steep hill. View facing north from Kathi's apartments. 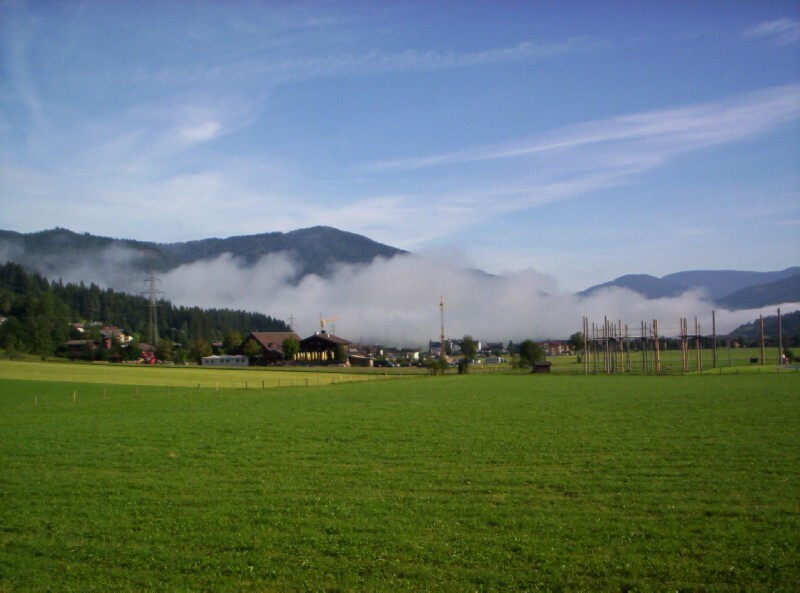 The patented Enns valley mist is in the background. 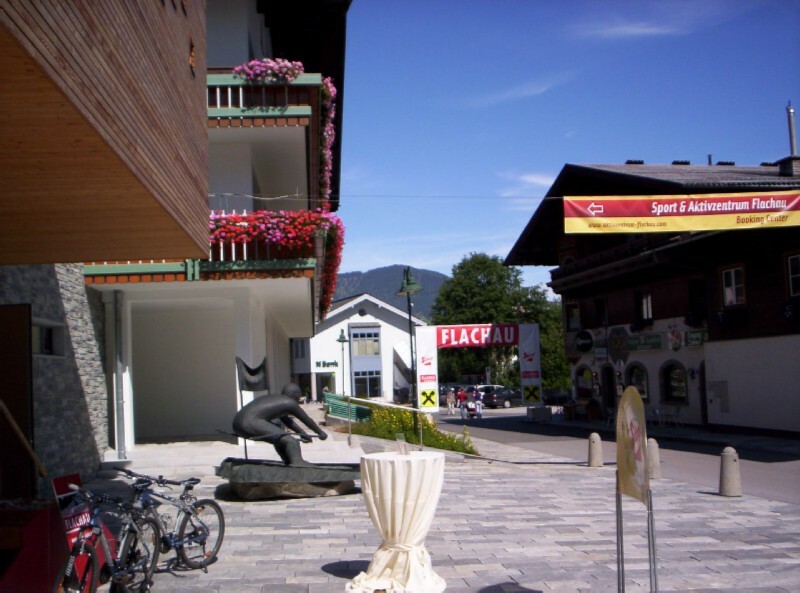 Statue of Flachau's favorite son - Hermann Maier - former world champion downhill skier. 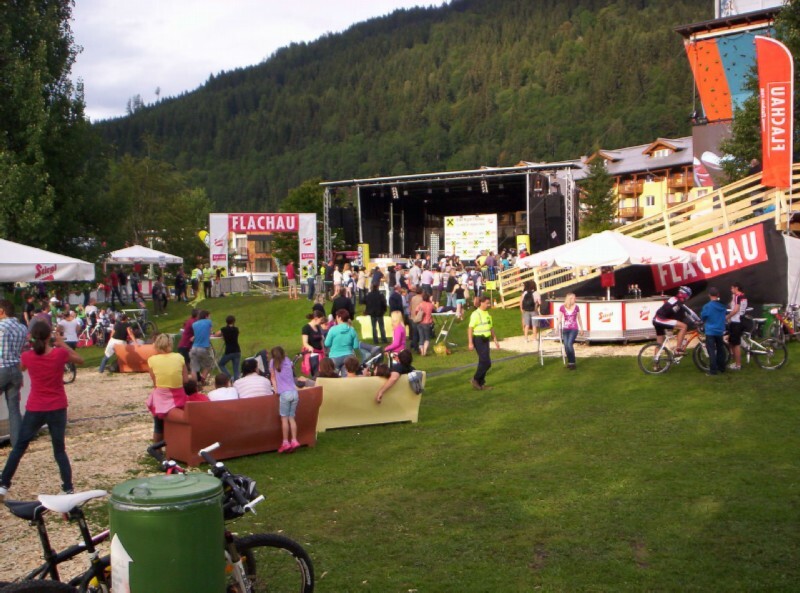 Flachau is a ski resort but also promotes Summer tourism. We happen arrive about the time mountain bike races were wrapping up. 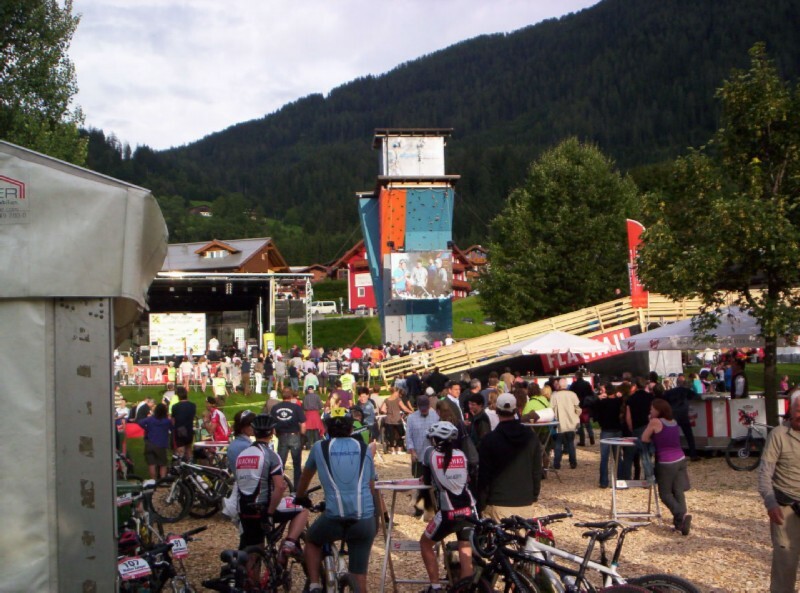 The town was swarming with riders in full uniform on fancy mountain bikes. There was also something going on called Bike-Night. Aug 14 Sunday - sunny and mild: Attended a standing room only mass with choir (mostly traditional music except a weird rendition of Down by the Riverside) at the village church on top of hill. 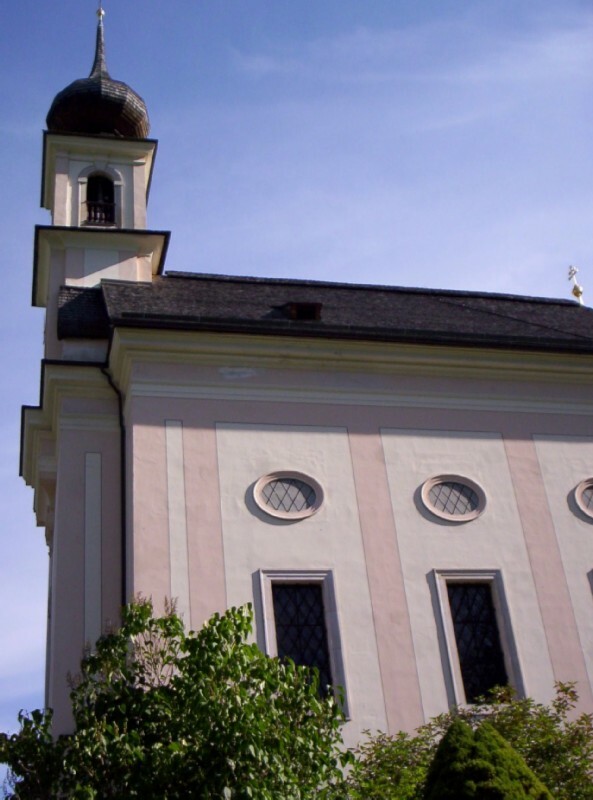 Flachau parish church high atop a hill adjacent to the center of town. After mass we climbed down the hill and caught bus that carried bikes up to Gasthof Alm. 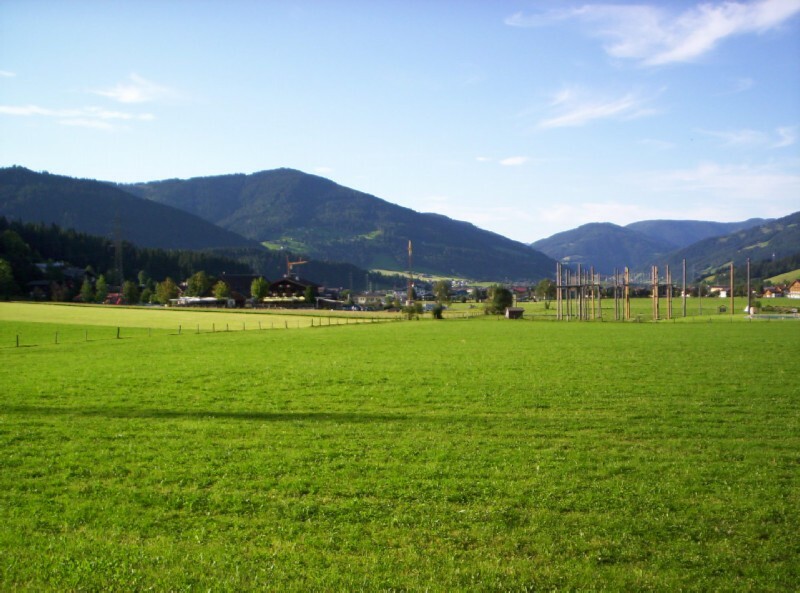 Gasthof Alm is located at the start of the Ennsradweg near the headwaters of the Enns. 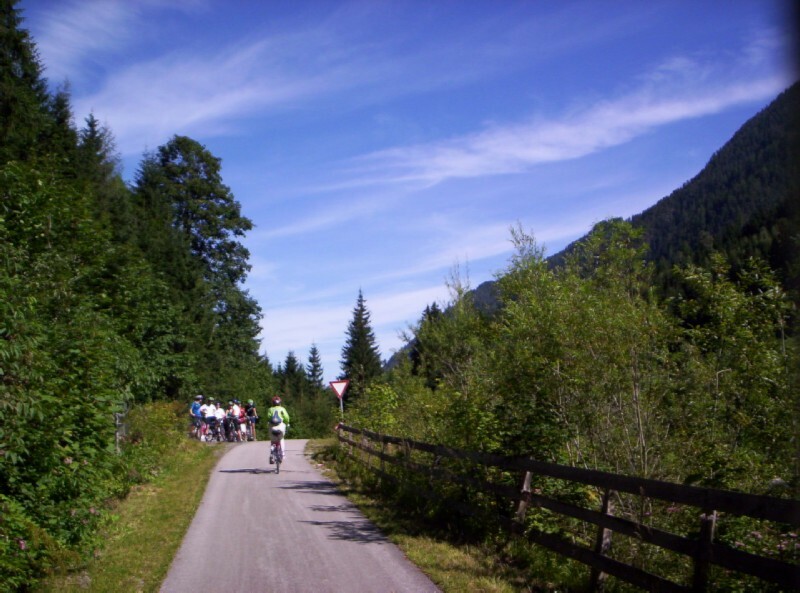 I was interested in taking the bus and then riding the 8 miles back to Flachau because in our previous two tours along the Enns, we had started at Flachau and Radstadt, respectively. At that time I did not want to bike up the mountain to the start, and didn't realize buses could take you. While on the bus, Jeannine worried because it seemed to take forever and go up and down. It must have been an optical allusion because we sailed down and got back to Flachau in about an hour. I was disappointed that when the bus let us out at the Gasthof Alm stop at the end of the line, the actual gasthof was still some distance away up a zig-zagging road. Near the start of the ride back. The 1st third of the way was on a country road with very little traffic since we were paralleled by an autobahn somewhere up the mountain side. After a while a bike path appeared. We met a large number of riders heading up the hill in the opposite direction. Same view to the north from Kathi's; this time on a sunny afternoon. Aug 15 Monday  predicted rain most of the day, thunderstorm. Today we returned to Salzburg to return the rental bikes and catch the train to Berlin. 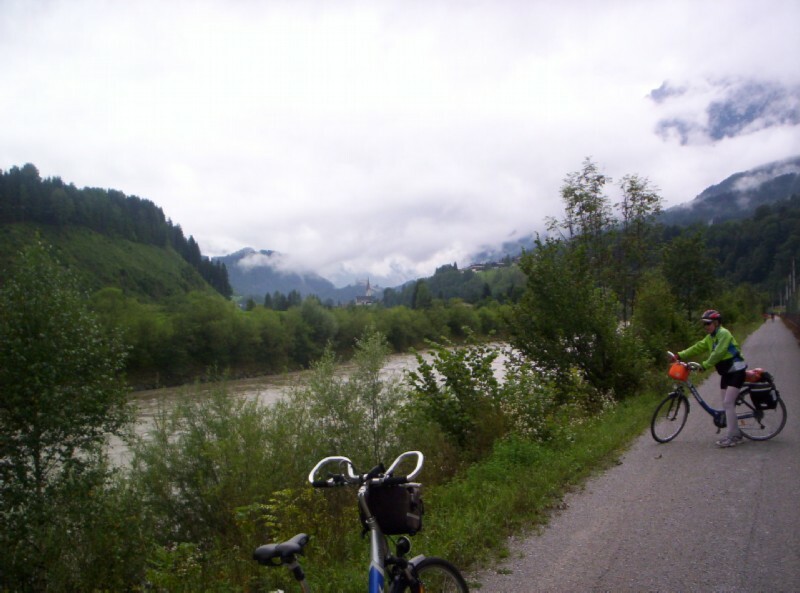 I wanted to bike to Bischofshofen on the Salzach with a direct connection to Salzburg, rather than backtrack to Radstadt and perhaps have to change trains in Bischofshofen anyway. 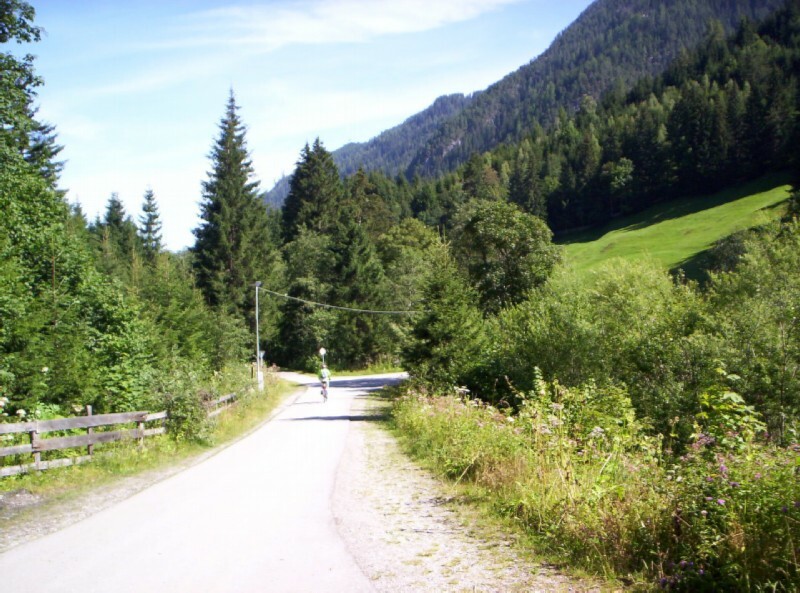 Back in 2002 we had biked from Bischofshofen to Flachau; and I remembered a long climb and then a downhill into the Enns valley. Since we were going the other way, I worried about hill out of the Enns valley. A website with GPS data indicated that the climb was only 93 feet in about 1.2 miles; and it did turn out to be negligible. We sailed down to the Salzach from Eben in Pongau. Resting before heading downhill from Eben in Pongau to Bischofshofen. 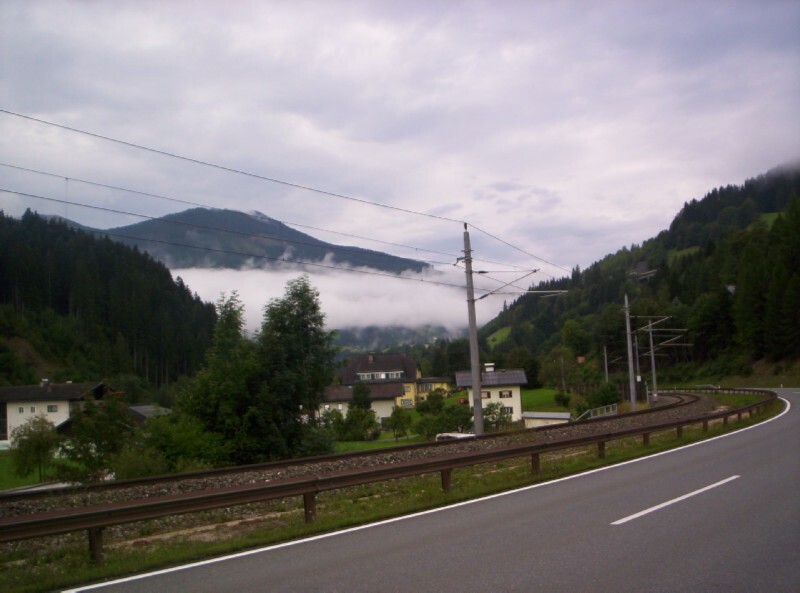 There was very little traffic on the road, partly because of the parallel autobahn somewhere on the mountain to the right, and partly due to it being a holiday - Maria Himmelfahrt (the Assumption). So far the predicted rain is holding off. We topped to rest in Pöham where there was an outdoor mass going on in front of a church right along the highway. The local Musikkapelle (brass band) in traditional costume played the hymns. 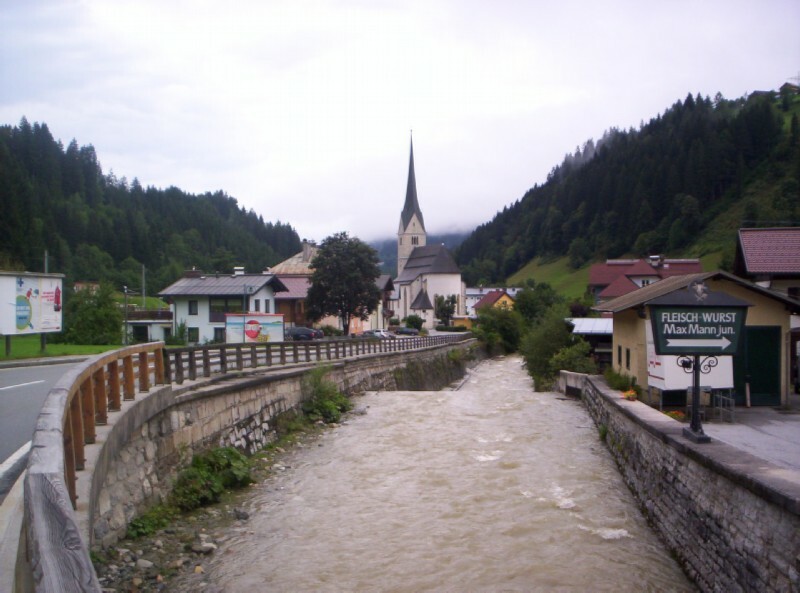 When we reached the Tauern Radweg along the Salzach north of Bischofshofen, we decided to head north along the river to catch a REX in Werfen. 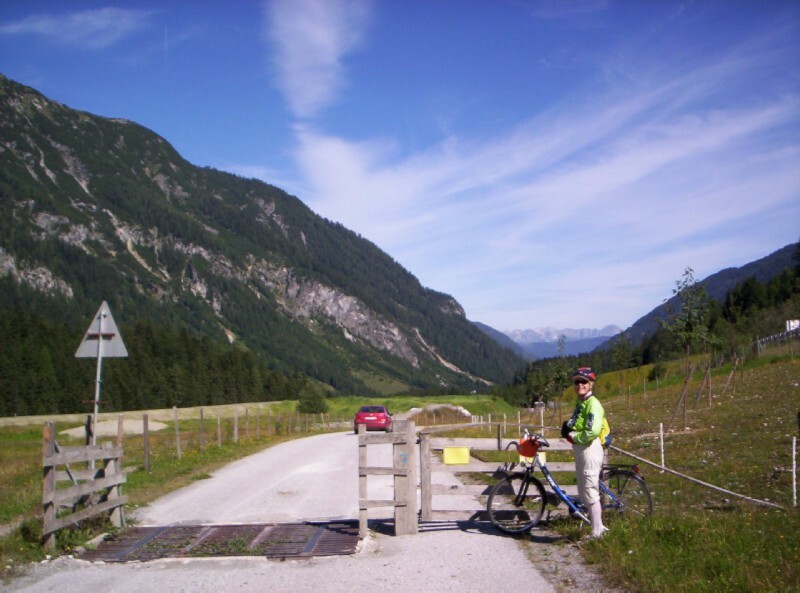 Along the Tauern Radweg between Bischofshofen and Pfarrwerfen. The clouds indicated the predicted rain would materialize. It started raining as we passed right by the Pfarrwerfen station. From the schedule I had gotten the idea that the next train would be an REX which stops in Werfen but not Pfarrwerfen. So we continued on the 2 miles to Werfen; and by the time we reached it, we would have been soaked if not for my fancy rain jacket and Jeanine's pancho. The ride in the rain was all for naught because the next train turned out to be an S-bahn (local) which stopped at Pfarrwerfen and every station and Haltestelle along the way. 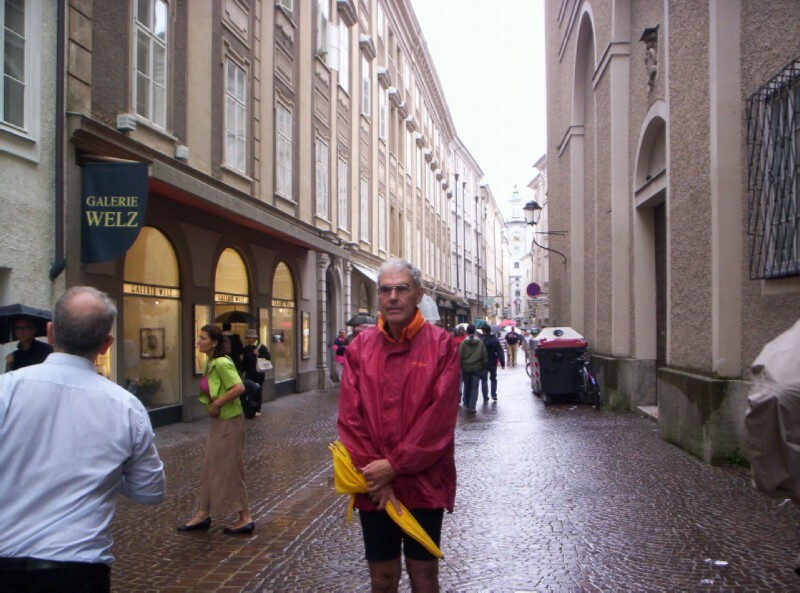 In Salzburg we headed to the old city where we noticed that Topbike was not open due to the light rain. So we parked and walked around the old city, stopping at the Cathedral and Franciscan Church. A noon mass was just ending at the Cathedral; and we were treated to a Soprano and organ Mozart concert. The schedule indicated that we had missed the 10:00AM Mozart high mass. 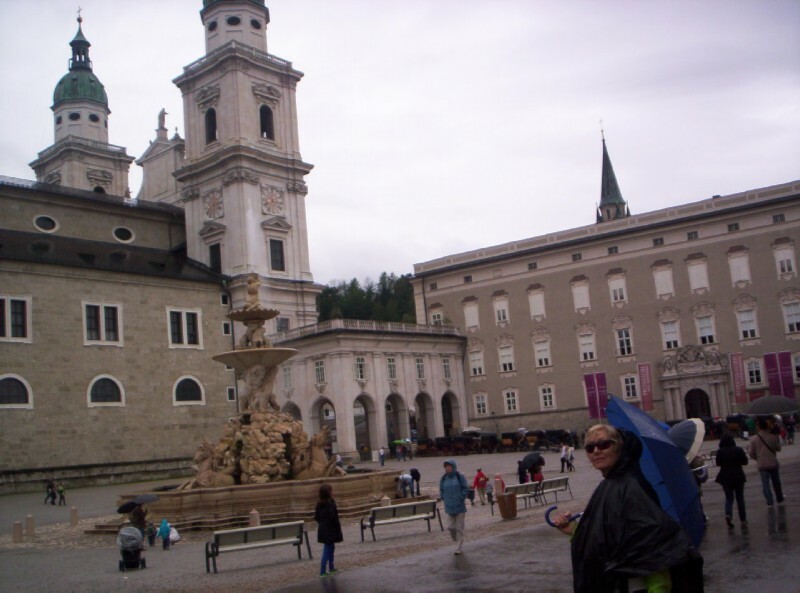 We then headed back across the Salzach and through a central shopping district frequented by locals. It was wall to wall pedestrians even though everything was closed due to the holiday. 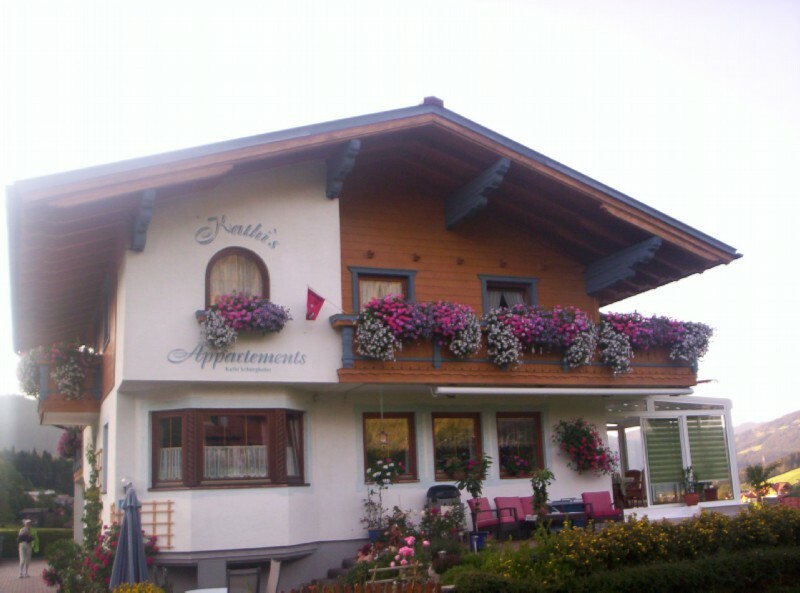 We then checked out the privatzimmer that we would be staying at when we returned to Salzburg the night before flying back. By going over a set of steps directly from the platform and through an apartment building parking lot, it was only 2 1/2 blocks from the station. Domplatz in Salzburg - cathedral to the left and former bishops residence, now part of a university, to the right. Pedestrian zone in a shopping area frequented by locals in the Schallmoos neighborhood, across the Salzach from the touristy Altstadt. Later, in order to return the bikes to Topbike a little over a mile from the station, Jeanine plunked herself, our luggage, and her bike down at outdoor table of a Chinese restaurant near the station while I rode my bike to Topbike. By this time it had stopped raining and they were open. I believe one could return a bike when they are closed by locking it up and putting the key in a box for that purpose. I then walked back, returned Jeanine's bike and walked back again to where we had Chinese food before heading to the station. A rental location at the station would have come in handy. While we were waiting on the platform, a special excursion train with vintage cars pulled into the station. Scarlet O'Hara and Rhett Butler stepped off the vintage train. The overnight ride from Salzburg to Berlin involved an EC and CityNightLine, changing in Munich Ost (East). The EC ran from Belgrade, Serbia via Zagreb, Croatia, and Ljubljana, Slovenia to Munich, picking up an Austrian section in Villach. We wound up in a coach in the Belgrade section with 2x1 seating. I would have thought we were in 1st class were it not for the regular looking passengers. 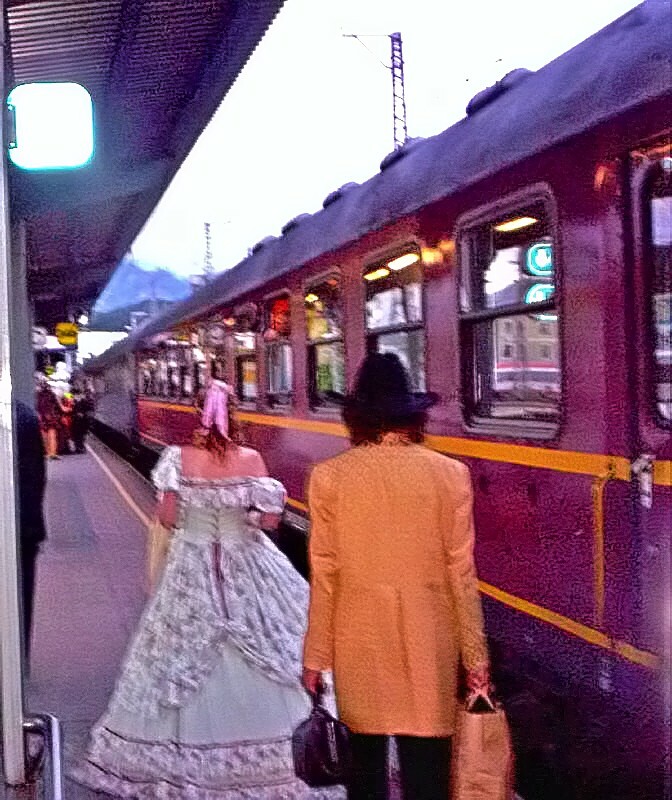 The Austrians delivered the train to Salzburg on time. But no sooner did we cross the border into Germany than we encountered unscheduled stops and slow orders, due I'm sure to track work. It was scary because we had only a 22 minute layover in Munich Ost. But a very helpful conductor assured us we would have 10 minutes, which track it would be on, and how to reach it. Sure enough, we easily found our train, car, and compartment. Our economy compartment had bunk beds with a covered wash basin for storing stuff and a locker with room for 1 pannier set. Unlike Amtrak roomettes, there was room for 2 to stand up with both beds set up for sleeping; but it was almost impossible to sit on the bottom bunk with the top bunk in the horizontal position; and there were no seats.